Maroon Clownfish (Gold stripe) "Premnas biaculeatus"
The Maroon Clownfish, Premnas biaculeatus, is a species of clownfish that is found in the Indo-Pacific from western Indonesia to Taiwan and the Great Barrier Reef. It is also known as the spine-cheeked clownfish, or the maroon anemonefish. They can grow up to be about 17 cm (6. 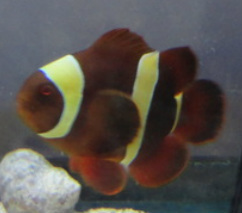 7 in), and as they grow, they become more aggressive towards other clownfish. It is not recommended to mix them with other clownfish. The stripes across the body are normally white, but they are yellow in the taxon epigrammata. The female is usually larger than the male and dark red or maroon, and the male smaller and a bright red. Because of its spines, this clownfish should not be caught using a net. The spines can get entangled in the net, which can injure the fish. Instead, catching with a cup is recommended. Note: This is a fantastic "show quality" adult fish! It has been tank raised in Milwaukee!